It is very easy to identify your Soul Card in the Tarot. The 22 Major Arcana Tarot cards have a direct relationship with Numerology. Through the calculations based upon your birth date, Numerology will tell you the Life Path number of the path that you are travelling upon. This number then relates to a Tarot Major Arcana card. When we are talking Tarot Soul Cards and Numerology there are 18 possible path types that can be applied to the birth date when identifying the Soul Path. I have developed a method that allows you to determine the Soul Path using all 18 paths. To be fair and equitable there are no Master numbers. This system allows for an even distribution of the 18 paths to the entire population. No one is any greater than any other in this life. Souls may be developing at different stages but they all will be equally tested according to the level that they are considered able to manage. To determine which Life Path that you are currently travelling upon add together the numbers of your birth date. The following example uses the birth date 4 November 2015. The number 2020, the sum of your dates, is what I call the Calibration number because it combines the numbers of the day, month and year and calibrates them by synthesis into the rhythm of the universal patterns. Now, divide the Calibration number (e.g. 2020) by 9. Why 9? This is the number of different vibratory patterns in each of the two sets of paths - outward and inward. This gives a quotient and a remainder - 224 remainder 4. The quotient, 224, tells you that in the number 2020 there are 224 complete cycles of 9. The remainder tells you if you are part way through the next cycle. Of course a remainder of 0 tells you that you are at the end of cycle. So, the quotient tells you whether the remainder is on an outward or an inward cycle. In the example given, the remainder of 4 is on a new outward cycle. This means the path is that of the Emperor – the Tarot Major Arcana card labeled IV or 4. If the quotient is an odd number then any remainder will equate to one of the Tarot Major Arcana cards in the second series of 9. 2051/9 = 227 remainder 8. The quotient 227 is odd so the remainder 8 is on an inward cycle (the 2nd series of Tarot Major Arcana cards between 11 and 19). In this instance the Tarot card is the Moon labeled XVIII (18). In the situation that the remainder is 0, then the path is either a 9 (the Hermit) or a 19 (the Sun). In this circumstance if the quotient is an even number then the path number is 9 (the Hermit), and if the quotient is an odd number then the path is 19 (the Sun). 2052/9 = 228 remainder 0. The quotient 228 is even so the remainder 0 represents the completion of a series on an outward cycle. This is the Hermit card at the end of the 1st series of Tarot Major Arcana cards from 1 to 9. In this instance the Tarot card is the Hermit labeled IX (9). 2043/9 = 227 remainder 0. The quotient 227 is odd so the remainder 0 represents the completion of a series on a return inward cycle. This is the Sun card at the end of the 2nd series of Tarot Major Arcana cards from 11 to 19. In this instance the Tarot card is the Sun labeled XIX (9). This method of calculating Life Path numbers gives an even distribution of path numbers and ensures all numbers and all Tarot Major Arcana cards from 1 to 9 and 11 to 19 are used in a fair and equitable way. There are no Master Numbers (e.g. 11 or 22). If someone is a master then they will be a Master incarnated on one of the specific paths. This date does not get reduced any further. You have arrived at a Master Number. One problem with this system of Master Numbers is unequal distribution. In a fair world, it is reasonable to expect that we will eventually get a fair distribution of things. In this system of Numerology there will always be an inequity. There will never be as many 2 and 4 people as there are the other numbers because some of them do not reduce down below 11 and 22. This is significant when comparing types of people. Apart from this where does this idea - that you are travelling upon a path - come from? My answer to this question is the Jewish Kabbalah. In the Kabbalistic system 10 states of being are connected by 22 paths. These 22 paths relate to an organised pattern of lessons and development. 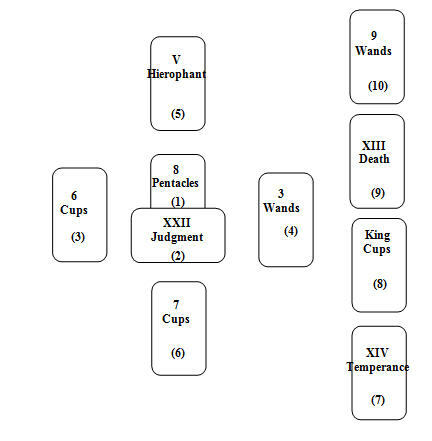 It is not difficult to make a connection between these 22 paths and the 22 cards of the Tarot Major Arcana. As you see above, Numerology also has a relationship with the number 22. The numbers 11 and 22 are considered to be Master Numbers. So, we have three systems - Numerology, Tarot and Kabbalah - all referencing the number 22 and all having a relationship with Life Paths of the soul. So, if there are 22 paths, then why does traditional Numerology only provide 9 general numbers and 2 Master Numbers? One reason is that the usual method of calculating a Life Path number, by using the method of reduction shown above, means that everyone will have a number between 1 and 9 unless you stop at one level higher like the 11 and 22. If you stop at 14, for instance, then you will never get a base 5 number. This is the same problem with 11 and 22. The issue is that no one has ever thought about it enough to develop a means of properly and accurately calculating the Soul Path number. So, here we have a system that has a possible 22 paths but it does not use all of these Path numbers. Of these 22 available options traditional Numerology maybe uses the 0, the 1 to 9, the 11 and the 22. There is no answer or explanation as to what happens with the 12, 13, 14, 15, 16, 17, 18, 19, 20 and 21. Some systems allocate these numbers to a personality number or some other type of descriptor and you may get allocated two numbers. Then some people only get one number and some get two numbers. There is a lack of consistency and the use of the words “soul” and “personality” are used flippantly without actually being able to justify the association. The system of Tarot, Numerology and Kabbalah is a complete system. The full range of 22 cards, numbers and paths provides a developmental process that applies to universal life. I don’t think it is right that nearly half of the path numbers are just not used. So, how do you do a calculation to fairly and accurately determine the Soul path? How do you mathematically determine if a soul is on a 1 path or an 11 path? Another problem with this system relates to the use of the number 22 as a Master number. The 22 paths are labeled from 0 and finish at XXI (21). There is no path or Tarot card with the number or label representing 22 on the face of the card. The 22nd path/card is given the label in Roman Numerals XXI or 21. This means that if, in the traditional system, you are considered to be a master 22 then you are actually on the path labeled 21, the 22nd path which is the Tarot card titled "the World". This thinking also may be applied to the Master 11. The 11th Tarot Major Arcana card is the 10 of the Wheel of Fortune. To be consistent, if the Master 22 is the World card (21) then the Master 11 relates to the Wheel of Fortune (10). Going the other way though, if the Master 22 is something beyond the Tarot Major Arcana card system and is intended to relate to the number 22, then it could be said that the Master 22 relates to the full set of the 22 Tarot Major Arcana. This would mean that the Master 11 relates to the Tarot card Strength or Justice, depending upon which system you reference to. Before Arthur Edward Waite and Pamela Coleman put together the Rider Waite Tarot deck, the Tarot card labeled XI was always Strength. Waite interchanged this card with Justice which was always previously labeled VIII. The 0 (i.e. the zero) represents the Kabbalistic idea of nothingness. The Kabbalah claims that everything came from the Absolute Limitless Light (Hebrew - Ain Soph Aur) otherwise referred to as nothingness. When their God decided to create a new world, a void was created and into that void (space) life as we know it (everything) was created from nothing in the instance of a Lightning Flash. In this action the 10 Sephiroth (states of being) were created representing the 10 numbers (0 to 9). Connecting these 10 states of being were the 22 paths also relating to the 22 letters of the Hebrew alphabet. Each of the Hebrew letters was also identified with a number. In this system, everything always starts with 0 (nothing). In some old systems of Tarot, the 22nd card was the 0 which is the Tarot card titled "the Fool". This is because they did not understand what to do with the 0. Mathematically and Kabbalisticly, of course, the 0 belongs at the very beginning. This is where the members of the Order of the Golden Dawn (Waite, Crowley, Foster-Case, McGregor-Mathers) placed the Fool card. Some other old systems placed it between the 20 (Judgment) and the 21 (The World). Some systems see the two series of cards - single digit and double digit - as dual entities, like the front and back of a coin. If you are a 1 then you may also display the attributes of an 11 in different circumstances. Others add the 1 + 1 of the 11 and get 2 and make the relationship between the Strength card and the High Priestess. Depending on how you make your relationships, 1 and 11 and possibly 21 may be related or 1 and 10 and even 19 may be related. There may even be a relationship between 0, 10 and 20. Like with most things, the human mind can make relationships. Whether the associations are the correct relationships is the difficult question to answer. I have no issue with the two series of cards having dual relationships but I believe that there are two distinct sets of cards that make up the evolutionary series of development and growth of the soul and the human person. This development commences from the nothingness - the 0 known as the Fool. It is nice that the 0 resembles an egg and it is reasonable that all of the potential for life is held in this figure. The 0 - the Fool - represents the concept of life before any development has commenced. Everything that will develop as a living entity is held in that egg. The first thing to emerge from the egg is identified as the 1 of the Magician providing action, creativity and the illusion of life. In all aspects of human development this is the beginning of the aggressive, demanding ego. The Magician also magically provides an identity and individuality - all things that manifest the singleness of the 1. This is the first action of life and as such there is at this time no balance or brake on the developing ego. It is unreasoned, unbridled power. This is the first physical manifestation. The 2 that follows the 1 is the balance to the 1. There are now two equal things. The High Priestess is the calming influence on the Magician. She shows qualities of peace, understanding, acceptance and passivity and is conducive to harmony. This is the first instance of the developing conscious self that mediates and controls the raging ego. Without this the ego would be out of control - ever demanding. The High Priestess is the seat of our emotions and is all about feeling. She doesn't perhaps know why but she feels it and instinctively understands emotional matters. Together, the marriage of the masculine and feminine forces creates a 3rd energy. A beautiful child of nature that is in sync with the forces of nature and the earth. This is the 3 of the Empress. This is the first expression of the two dual energies of action and emotion and generates reason, intellectual ability and the basic development of the mind. The 3 can display unrestricted creativity. This is the nature child - nature within a physical body - that is unfamiliar with physical restriction. She doesn't want to restrain the mind. She just wants it to be allowed to run free. The next entity that restrains the natural desire for liberty and freedom is the 4 of the Emperor. It is reasonable to see the connection here with a 4-sided square where the 3 may be seen as the tripod and the triangle. The 4 needs a solid practical surface to sit upon and find balance. The tripod or 3-legged stool can pretty much find balance on any surface. As such the Emperor brings rules and structure to the physical, material world of the built environment as opposed to the natural environment of the Empress. Considering these four forces in the development of a child, we see the demanding ego of the new-born child balanced by the beautiful, peaceful aspect of the child's conscious self. This develops into the delightful nature child, the free spirited, unbridled energy of the toddler. In time the child needs to learn discipline - the rules and structure of the Emperor. This also imparts a development of the guided will towards positive intent and practical action as opposed to the idea of the free-form, natural flow of nature. The next stage for the developing ego requires the development of a set of values and principles. This is like when the child leaves the sanctuary of the home and goes to school. The Hierophant (5) is the teacher. The soul now starts to learn how to balance the drive for freedom with the desire for discipline. In the wider world outside the sanctuary of home the child starts to engage in relationships other than immediate family relationships. This is the stage of the Lovers (6) and deals with social groups and close, intimate relationships. Soon the will starts to develop, wanting your own way in the midst of life's many relationships. The Chariot (7) relates to practical application of the will and the use of the mind to control and manipulate the external, opposing forces. The young child and the ego are developing into strong individuals. Unless we now temper the individual with a sense of fairness in the form of Justice (8), our relationships could all be very confrontational and conflicting. The ego has now learned all of the developmental skills and the outward, extroverted nature for the first time starts to consider his further development. This is the 9 of the Hermit. 9's relate to completeness and finishing things. The Hermit looks inwardly, reflecting upon his development so far. He has travelled a long way since leaving the source and is intrigued with how he may balance the outward, egotistical nature. He senses there is a depth to his nature, another dual aspect of self that balances and fulfils him. He now resolves to find the other half. The personal reflection and internal review of the Hermit leads to the process of the 10, the Wheel of Fortune. The Wheel spins and turns and measures the development so far, comparing the undeveloped potential of the Fool 0 with the developed ego of the Hermit 9. The Wheel is the 1st review of the potential of the 0. Four human functions have been developed - intuition, reason, emotion and action. The four functions form pairs of balanced dualities. Intuition and Action form one pair. Reason and Emotion form the other pair. In our development we tend to develop one of each of the pairs in detriment to the other. If we develop our intuition then our application to personal action is depleted and vice versa. Similarly, if we give way to our emotions and feelings more so than the reason and the mental processes then one will be stronger than the other. In the symbolism of the Wheel of Fortune these four aspects are represented. The Wheel turns and weighs. The most developed function will be heaviest. The least developed will be the lightest indicating it needs more attention. This review provides the developmental focus of the next series of paths which involves the developmental of the internal, conscious self. The return journey of the soul requires massive resources of internal strength and a resolve to surrender the aggressive power that you have acquired, trading it for a passive assertive power instead. Surrender yourself to the fact that you are not the greatest being and ego ever created on earth and be prepared to humble yourself and start learning all over again. It is like going through childhood, prep and primary school. You get to the top class of the school and then you go to high school. Now you must start at the bottom grade again and work your back way up. This is why the first lesson of the second series is Strength (11). Where the Magician was the 1 of the first series Strength is the 1 of the second series. The Magician shows a male figure learning to manage, control and manipulate the four human functions on the table in front of him. Strength shows a female figure controlling the figure of a lion. The lion is an untamed animal and represents the wild, aggressive ego. The female figure displays a gentle, passive person - a conscious, aware entity controlling the raging ego. The next card in the series is the 12 of the Hanged Man. 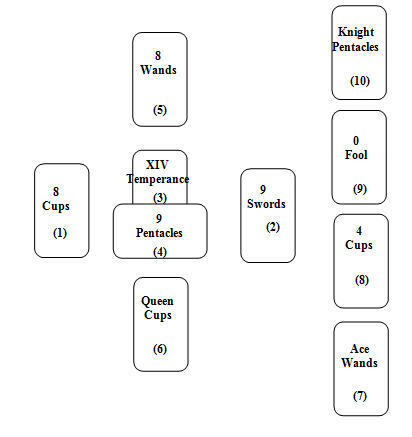 The Magician (1) and the High Priestess (2) formed a dual pair in the order of male/female, active/passive. Now the cards of Strength (11) and the Hanged Man (12) form a dual dual-pair in the opposite order of female/male and active-passive/passive-active. The Hanged Man is that angry, aggressive lion (the ego) that has been put under control. He has to learn to repress the aggressive male instincts that he has learned for so long and replace them with a passive desire to engage in life maintaining self control and not having to be controlled by others. This is an internal struggle. Where the High Priestess sat upright, serenely between two pillars, representing the opposing forces of life, the Hanged Man hangs upside down strung from the branch of a tree. His head is lowered into a hole in the ground where he spends his time forced to consider the earth, perhaps the worms in the soil and the ways of the world. He must come to terms with his situation and learn to stop struggling and be prepared to let go. Only then will he be released from the tree and allowed his freedom. This release is shown as Death (13). Now perhaps we can understand the meaning of this Death card. It represents a freedom, a release, from physical boundaries. We must let go of our belief in the dominance and need for the physical, material aspects of life. As you may appreciate the 13 of Death and the 3 of the Empress have a connection. The 3 of the Empress is nature and freedom in physical, material form. The 13 of Death raises your awareness beyond the physical, material world. This is about being free and liberated despite your physical constraints. When we experience the release and complete freedom of death our sense of boundaries is tested. Temperance (14) is best described as "moderation in all things". The boundaries are not set by an external force though such as in the 4 of the Emperor. This is self-moderation. The golden rule of life is to always seek the middle path. The symbolism of Temperance shows a female form mixing, blending two containers of water (the emotional element). She has one foot on the earth (the physical element) and one foot in the water. She is involved and intimate with her emotions and controls the physical. The 14 of Temperance also shares a relationship with the 5 of the Hierophant through the process of reduction as 14 = 1 + 4 = 5. The 5 of the Hierophant represents values and principles and is also about finding a balance between discipline and freedom. Temperance must now take these lessons taught many incarnations before and demonstrate a philosophy of self-moderation. We now move to the test of the Devil (15). Isn't it fascinating that the 15 of the Devil has a direct connection with the 5 of the priest (The Hierophant). The 15 also has a relationship with the 6 of the Lovers through the reduction process as 15 = 1 + 5 = 6. We have found a resolve of Strength and built and tested that resolve as the Hanged Man. Having found complete freedom in Death, we have developed our personal values and principles and learned Temperance. The ultimate test is now faced in the temptation of the Devil. Have you really raised yourself above the mundane in life and severed your connection to materiality and addictions? The Devil will test you and find your weaknesses. How good are you at managing life in this world when you seek to be a spiritual entity? You will be tested. Once you have weathered this storm and overcome the base temptations of the Devil, you will now encounter the chaos and annihilation of the Lightning Struck Tower (16). Everything you thought was real, the beliefs that you held to be true, the relationships you held onto, these things can all be stripped from you in an instance. If you are resisting change, refusing to progress your life in the way that it is intended to be, then watch out for the Lightning Struck Tower. You will move on. Preparation is now being undertaken for rebuilding. Demolition is in progress. It may seem unfair and unbearable but once the false beliefs and relationships are understood and seen for what they are, it will be seen as a blessing in disguise. The 16 of the Lightning Struck Tower has a clear connection with the 6 of the Lovers. One is about building strong relationships and the other is about breaking them down. Through the process of reduction 16 = 1 + 6 = 7; so there is a relationship with the willpower of the Chariot. This is about breaking your will so that you understand that it is God's will and not your will. This is about learning that there is a higher authority greater than yourself and your purpose is to carry out the will of that higher authority as your own. After the humbling experience of the Lightning Struck Tower, it is time to set your sight on higher things and rebuild in accord with the will of the higher authority. The Star (17) is willpower raised to a higher level. This is about re-establishing grand design. The symbolism of the Star shows a female figure stripped bare. The earth around her has also been razed and is now showing signs of regeneration. She pours water, like Temperance, but she is not blending the waters. One jug of water is poured upon the earth, nurturing it and re-invigorating the earth (the physical element). The other jug is replenishing the pool from which she draws the water (the emotional element). Unlike Temperance she kneels upon the earth and one foot rests upon the water, not in the water, indicating the control she has over the emotional aspect of life and respect for life. The stars in the sky indicate that her mind is set upon higher, divine principles and not the mundane, practical, physical world. The connection between the 17 and 7 has already been referred to, in the idea of the higher application of willpower. This is the practical use of the mind to control and manipulate the opposing forces of life and bring them to a better outcome for all humankind. The 17 through reduction has a relationship with the 8 of Justice; 17 = 1 + 7 = 8. The 8 of Justice was about being fair and just in our relationships with others. The Star is about setting things right with our god and making life fair and just for all humanity. Stars shine in the night and give guidance and direction. They may be less noticeable in strong moon light and cannot be see at all in sun light. The influence of the Moon (18) may at times seem unfair, unreasonable and irrational. There may be unresolved issues from the past that sit hidden beneath the surface, like rocks just beneath the surface of the water that can occasionally break the surface and snag and scuttle an unsuspecting traveller. These issues need to be dealt with. In moonlight things are harder to see and discern than in the brightness of day. It is more difficult to fathom and understand because they loom in the dark like a nightmare and may just be the phantoms of our fears and imaginations. What is real and what isn't? The symbolism of the Moon card shows a gnarly crayfish climbing, emerging, from a pool of water (the emotions). This pool also represents the abyss that separates humankind from their higher source and their god. The abyss has been filled with the watery emotions of deep knowledge and understanding and in the phase of the moon you have been immersed in that pool. You may be not a pretty sight when you know, acknowledge and understand the dark shadow aspects of yourself but you have to learn to accept yourself and others as you are and they are. Everyone has imperfections and is on a journey. Climbing out of the pool on the other side of the abyss, you have achieved and although your struggle has even more difficult than even you imagined. You now make way along the narrow path. You must navigate this path, finding your way between the opposing forces of nature represented by the wild wolf and the domestic dog (both howling animals), in the dimness of moonlight. The narrow path means there is not much room for error. The higher paths in the journey and development of the soul are exacting and rigorous. The demands are high and so are the rewards. The 18 of the Moon has a connection with the 8 of Justice. As stated above their does not seem to be much fairness in all of this. The fairness and justice dispensed by the courts, dealing with the mundane issues of living does not come close to the understanding and compassion required to comprehend the fair treatment the soul receives in resolving the karmic effects of many lives. What is fair and what is unfair may not be ours to perceive unless we raise our understanding and awareness to higher levels of consciousness. The 18 of the Moon relates to the 9 of the Hermit through the process of reduction; 18 = 1 + 8 = 9. The Hermit chose to shine his light in the dimness of knowledge, being prepared to seek further understanding, not really being aware of the immenseness of the inner journey he was undertaking. After much internal wrangling, introspection, reflection and growth the ego of the Hermit is now coming out of the inner realms of the Moon, prepared to now return to the bright sunlight. At the time he, the Hermit, was not aware that his lantern was a mere shard of light and no comparison to the full light of the sun, yet without the light of that lantern he would not have found his way. The Sun (19) like the 9 is the end, the completion of things. The naked child, nothing left to hide, allows the horse (life) to go where it will and he just bounces along not even holding on. The journey of this sun child is most likely more difficult than most. Souls on this path are not treading lightly and yet it may seem they are just rollicking and frolicking along. Although it may seem like it, this is not a walk in the park. All of the lessons from the Magician to the Moon can now be asked of this soul. The challenge of this life is to respond with balance and equanimity. There are two aspects of our self, like the masculine and feminine of the Magician and the High Priestess, the Moon and the Sun are required to unite in balance and harmony and fulfill the individuation of the soul. The ego and the conscious self will both be tested. If either is found to be too strong or too weak, the cracks will show. The flaws in the personality will be exposed in the bright light of day. The responsibility of the soul on this path is immense but it must not be seen or show itself as being onerous and a burden. The sun must laugh and shine for the benefit and entertainment of others despite whatever is going on in their life. The 19 has a relationship with the 1 of the Magician through the process of reduction; 19 = 1 + 9 = 10 = 1 + 0 = 1. This is the alpha and the omega - the beginning and the end. The 1 starts things. The 19 ends things. Everything is complete. The Magician holds a wand up to the sky and draws power, inspiration and wisdom from above and dispenses it as his own. The child that is the sun is the complete power, inspiration and wisdom but takes none of it as his own, knowing he basks only in the warm glow and light of the higher authority. He is the complete conduit and does not need a wand. Now what is left to be done? A full reconciliation and judgment of the success or otherwise of the developed potential that was the 0 of the Fool and is now completed in the Sun. Judgment (20) is the final judgment that precedes the rebirth of the soul. This is the instance that people talk about when they have had a near-death experience and their entire life has flashed before their eyes in review. The 20 has a relationship with the 0 and the 10. All three are instances of 0. The 0 is the beginning. The 10 is the review of the aggressive, masculine force and the 20 is the review of the feminine, passive but assertive force. In the reduction process you can see the connection these two processes have with the 1 of the Magician and the 2 of the High Priestess; 10 = 1 + 0 = 1; 20 = 2 + 0 = 2. Together they form a balanced duality. The final state of being is that of the World (21). This is the completeness of the 1 and the 2 coming together in the fullness and unity of the two dual aspects in individuation. The World is everything as opposed to the Fool's nothing. At anytime that we look at ourselves in review, we look at the whole package and this is what is meant by taking a holistic view. The complete thing is no greater than the individual parts but the outcome of the combined, united energy of the individual bits is greater than the energy and power of any individual piece. There is a connection between the 1, 11 and 21. They are all instances of 1. The 1 and the 11 are the dual opposites that make up the unity of the single entity that is the world. The Magician 1 is the first manifestation of 1 (the embryonic ego) that emerges from the potential of the 0 of the Fool. The 11 of Strength is the 1st repetition of 1 and the 21 of the World is the 2nd repetition of 1. The entity in the world card dances shimmers and moves in a constant state of fluid motion. We are continually growing and improving. At any given time that we look at ourselves, this is us. This completes my evolutionary journey through the Tarot Major Arcana and the 22 paths of life. Notice that as we start in the first series of single digit paths the explanations are more simple and as we progress into the double digit paths the explanations are more complex. This in itself shows the more complicated nature of the second series. Although the Magician (1) and Strength (11) are both 1 at the beginning of a series, it is necessary to show them as separate entities and separate paths that the soul journeys upon because they are both independent of each other. Each is necessary in its own way to the development of the soul. The paths are intimately connected and associations may be made in various ways. Everything is connected and there is a reason for everything. 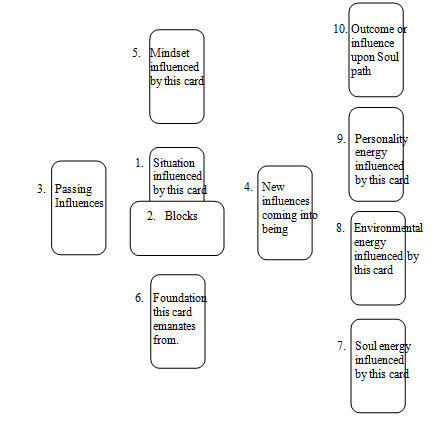 This does not take away from the fact that there are two paths - the outward path emanating from the source consisting of the Tarot cards 1 to 9 and representing the development of the ego - and the inward path returning to the source consisting of the Tarot cards 1 to 19, representing the development of the conscious self. These are the 18 paths that the soul incarnates upon in this life and I refer to them as the experiential paths. The paths relating to the four Major Arcana Tarot cards of 0 the Fool; 10 the Wheel of Fortune; 20 Judgment; and 21 the World, do not relate to life paths that we travel upon. They relate to transition states similar to what the Buddhist's refer to as Bardo states. The Fool (0) is the traveller on the journey - the embryo holding all of the undeveloped potential of life. The World (21) is the ever-fluctuating image of developed potential at any given time. Compare the state of the World with the Fool at any time to determine progress and fulfillment of potential. This comparison may be made at any time but there are two significant stages of review - one at the half way point in the form of the 10 of the Wheel of Fortune - and one at the end of the complete process in the form of the 20 of Judgment. What your Tarot Soul card tells you. In a nutshell the lessons of the Tarot card are the lessons of your soul in this incarnation. Some aspect of the Tarot card will resonate with you, perhaps stand out as being a common influence that you experience in your life, or stand out as being the nature of a hurdle or lesson that keeps coming back at you and back at you relentlessly. In your life you will experience all of the influences of all of the Tarot cards at some time or other. Everything moves and develops in the pattern of the cards but there are influences happening at many different levels. They will be more or less dominant. The Tarot Soul Card is a significant, overarching force in your life. You cannot avoid it. There may be only one keyword or phrase that sums it up for you. For example I was recently working with a friend who happened to have the Tarot Soul Card of the Emperor IV (4). The 4 is a very practical, physical number related to structure, rules and rigour. You may expect a builder to have a dominant 4 in their makeup. This man was not a builder and not particularly practical in any obvious way. He had spent his life as an academic immersed in the world of classical music and the arts. His dominant focus in his career was "composition". For me everything fell into place. This was clearly the Emperor being significantly influential in this life. Learning the rules of composition meant understanding musical structure and rules. He was able to explain explicitly when timing, rhythm, patterns were not in keeping with the expected and accepted practices of music. Music and composition dominated his life. Such a revelation and awareness of this significant influence is enough to make you realise the direction of your life and why it happened this way - why so many things happened the way they did to bring you along the path that you have followed. It can help you understand why your life has been so helplessly hollow and why you have seemed to always fight against some things. Once you realise the connection it can completely turn your life around and put you on the track to happiness and success. Learning and understanding the basic meanings of the cards of the Tarot in the first instance is not as difficult as it may seem. When you start applying them to human beings that is when the analysis deepens and at times it is not so simple. In this process you are not going to get a couple of pages of stuff that builds up your ego telling you how great you are. Sometimes you may just get one or two keywords. Follow this up with research and study. Learn to understand what these keywords mean and how it applies to you. Learn what the other Tarot Major Arcana cards mean and how they don't apply to you. This delimits you and helps to show your boundaries. This is not a psychic process. Without some personal knowledge of you, it can be difficult to understand how a particular Soul card has a meaningful application. Either some self-analysis or intimate discussion is required to make a correlation. When you do a Tarot reading the cards have the ability to tell you where you are now and what is happening in your life. 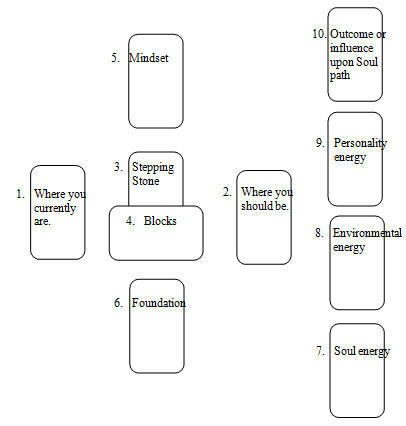 If you have a good understanding of your path in life then you can analyse the cards in the layout with a view to how this impacts upon your soul purpose. This may be very different to how the scenario impacts upon you. Where you are in life and where you should be in life may be poles apart. Now that you know your Tarot Soul Card then it is beneficial to do a Tarot reading. With your Tarot Soul Card you have an idea where you should be in life, now let the Tarot tell you where you currently are in comparison to this base position. I have designed the Tarot Soul Card spread around the structure of Celtic Cross spread. The first thing to do is to formulate in your mind that you are going to do the Tarot Soul Card spread, knowing the positions that the cards will be laid in and the meaning of the positions. Then focus your mind around the key question. I call it the “Key” question because if formulated correctly this question is the key that unlocks the mystery of your soul path. The question to ask is “Tell me about my soul path based upon my personal Tarot Soul Card of the …… (E.g. the Hanged Man or whichever is your Tarot Soul Card). Now, focusing upon this subject matter in your mind, shuffle the cards and when ready cut them into three piles using your non-dominant hand. Then regroup them as one deck in any order you desire. The cards are now prepared for the reading. Before laying any cards quickly take note of the card on the very bottom of the deck. I refer to the card as “the Overview”. Often I find that this card gives me a high level clue that helps to discern the true essence of the reading. Commence the laying of the cards. Take the card from the top of the deck and lay it in the 1st position (the left arm of the Cross). This card signifies where you are in life. Lay the next card in the 2nd position (the right arm of the Cross). This card signifies where you should be. Compare these two cards – are there similarities or conflicts. How wide is the gulf between? Similarities indicate that you are not far off your true path in life. If there are distinct conflicts in the nature of these two cards then it seems you may be reasonably off-track. Lay the next card in the 3rd position in the middle between the first two cards. This position signifies what helps you in bringing the two paths together. I like to think of this card as “the stepping stone” that helps you get from here to there. The 4th card is laid horizontally across the previous card. This card suggests what may be blocking you from synchronizing with your true path. The 5th card is laid above the other cards in what is forming as the middle column of the Cross. As in the original Celtic Cross this is the position of the Crown Chakra and suggests your mind-set in relation to this matter. This is where you think you are as compared to where the cards think you are. Compare these two cards – Card 1 and Card 5. Are you thinking accurately in your analysis of the situation or are you off the mark in how you see things? Often your own mind-set can be your greatest stumbling block to progress. Lay the 6th card in the Foundation position, beneath all of the other cards at the base of the middle column of the cross. This card, like the original Celtic Cross, suggests something from your past – something that is already in existence – that makes for a strong foundation stone to build upon in maintaining your journey in sync with your true life path. This completes the Cross – the heart of the layout. The next four cards are laid in a vertical column from the bottom upwards to the right of the Cross. Card 7 indicates the Soul energy that is currently being applied in your life. What is your soul crying out for? Card 8 signifies the energy from the environment that is currently being applied to your life. Is your environment helping or hindering? There are many environments that you participate in such as love, work, play etc. Does this card relate to any one in particular? Card 9 signifies the energy of your personality that is currently being applied to your life. Is your personality in sync with the needs of your soul? Are they working together in harmony or are they driving in different directions? Card 10 signifies the energy currently needed to be applied to your life to keep you on track or bring you closer to a synchronization with your soul path. This is something you can actively do to engage in fulfilling your soul path. As with any other spread it is important to look for patterns, consistencies and inconsistencies, within the cards that have been drawn. • Are there an overwhelming number of Major Arcana cards? Four or five or more Major Arcana cards suggest a significant life event or events are at issue here. Big changes are likely happening or are necessary to happen. More Minor Arcana cards suggests more of a fine-tuning, a tinkering around the edges. • Did you get your own Tarot Soul Card in any of the positions? Prick up your ears and pay attention. The position this card appears in is significant. • How are the suits represented? Is there any dominant suit? Is there any suit missing? Which of the four human functions – intuition/spiritual processes, mental processes, emotional processes, and active/practical processes – are you engaging or not engaging? • Are there any sets or series of cards e.g. 2, 3 or 4 of a kind or Knight, Queen, King? Are there any progressions indicating a development along a particular path? Can we discern growth or regression? My usual practice following the laying of the first spread of ten cards is to then draw a Rune from my set of Runes and a Fairy Card from my Fairy Card deck. The single Rune and Fairy Card are usually extremely accurate and helpful to confirm the major theme of the reading. Similar to the Overview card, they provide a supporting clue. You are now about to raise the use of the Tarot reading to the next level. The first layout of ten cards reflected back at you the situation as it is now – as you perhaps know it to be – there may have been no surprises. By taking a card from the first layout and applying it to a new reading it is almost like jumping from one dimension to a new dimension. As we drill into the scenario, and then maybe do it again, there is potential for becoming more and more predictive. The outcome becomes more and more focused into the future based on the supposition that if life follows this particular path as laid down by the cards then this is likely to happen. The answer to this 2nd question is best formalized in the following spread structure. ​In the first position - "Where you are now!" - The Devil 15 appeared. In the second position - "Where you should be!" - We received the 7 of Wands. These two cards immediately threw me into a spin. Knowing this person this was not what I expected. I would have been more expecting something like the 7 of Wands in the first position. This suggested that my client was not in control of the situation as much as I expected. Applying my mind to what I knew of this person, this was shaking the beliefs quite considerably. As usual everything is not always what it seems. These two cards told me that we have this well balanced Justice-type person who is tethered to the everyday world of work and addiction etc. The 7 of Wands told me that they should be on top of things, defending what they believed in. Instead they are working at the Devil's business and not their own. The third card - the stepping stone - was the Emperor - rules, structure, discipline. This is a key to explain the current situation. The fourth card was the 8 of Wands. This position represents hurdles and blocks to achieving your path. The idea of progress, ambition, achieving outcomes, all happening too quickly perhaps, climbing the ladder of success did not fit the person that I was looking at. Perhaps their self esteem and beliefs are tied too much to achieving outcomes. They need to show some discipline within their own self to override the ruling patterns in their life. The foundation card beneath - something from the past that this was built upon or connected to - was the King of Swords. As a person I would immediately associate this card with my client's father - a strong minded man who taught the children that if you weren't working then you're not worthwhile. Then wasn't much credence given to the creative arts - that was time wasting. The 5 of Pentacles appeared in the Soul energy position - the "out in the cold, cold snow" card of missed opportunities. This is a card not at all like my client as I understood things but then I thought, "We're not talking about my client as I see them - we're talking about my client's soul!" There be the difference. This is very interesting. Maybe the soul is missing opportunities because of this particular mind set. The next card representing the Environmental energy affected by this is the 9 of swords - someone with a mind full of fears. The Personality energy affected by this is demonstrated by the 5 of Swords - confrontation, dispute, challenging. The final card was the Lightning Struck Tower representing the outcome that could help in this situation - things changing suddenly and dramatically. 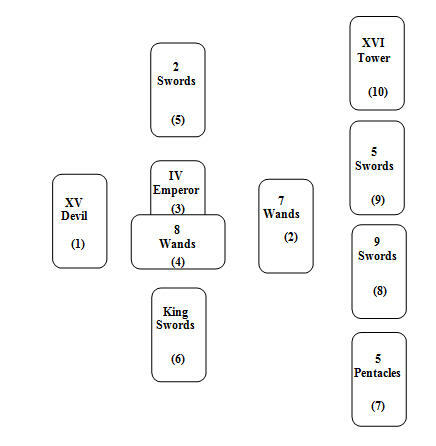 There is an interesting array of 5’s in this layout – 15 (Devil); 5 Pentacles; 5 Swords – there is a struggle going on here between discipline and freedom – the principles of the Devil/the World of Men & Women are at play. The starkness of the 5 of Pentacles (fear of losing everything or having nothing) and the drama of the 5 of Swords (conflict – you’ll be in trouble if you are disobedient). The card placed at the bottom of the deck was the Hermit representing someone going inside seeking to know themselves better. Sometimes the best form of attack is retreat. The Rune drawn was Berkana meaning growth and renewal. I can understand the relevance of this Rune. Harking back to the card beneath the deck, the Hermit, I see the need to go inside yourself to reflect and get in touch with the real you, instead of responding to the stimuli of the King of Swords. Break the hold held by the parent. The Fairy card of "New Location" is challenging - new place of living, new work etc. It's about making some physical shift maybe that will bring about the change necessary to overcome the controlling patterns of childhood. We then took the Tower card and asked, "Tell me about this card and how it is influencing my life path journey?" ​The first card, suggesting the situation that this reading relates to, is the 8 of Pentacles - the worker and the work situation. Crossing this card, the second card indicates hurdles or blocks in your way, is the card of Judgment - rebirth, growth, complete review and being open to review. The third card represents an influence that is passing and in this position is the 6 of Cups - connection to childhood memories and beliefs. The fourth card represents the new influences coming into play. Here we have the 3 of wands - new developments coming to us, creative expression, creativity - ready to step on board your ship as it comes in, arriving in the harbour loaded with gold and the prospects and hopes of the future. The mindset above these cards is the Hierophant (5) - teachings, beliefs, principles, values. The foundation below is the 7 of Cups - hopes and dreams, making emotional choices. The Soul energy is represented by Temperance (14) - peace, balance, equanimity, an easy blend. The Environmental energy is the King of Cups - this could be my influence (the man of love). The Personality energy is held in the Death card (13) - change in the personality in such a way that things will not be the same again - release, liberation. The Outcome card is the 9 of Wands - passions and dreams, protecting and defending what you believe in. That card that was on the bottom of the deck for this reading was the 10 of the Major Arcana, the Wheel of Fortune - the coming of a change in the wind. If acted upon this reading suggests there will be a shift in the way that my client applies herself to her soul purpose, freeing herself from the bonds of parental controls and patterning from childhood, being free to be the way that you want to be. ​The 1st card - where I am now! - is the 8 of Cups - the person who is emotionally searching for another way. The 2nd card - where I should be! - is the 9 of Swords which shows someone plagued by worries and fears - or is it someone who has found themselves at the completion of a particular mindset or way of thinking? The 9 means completion and the Swords represent the mental/thinking processes. There is a certain compatibility between the two cards. One is at the end of a certain way of thinking and the other is searching for a new emotional way. The stepping stone between the two cards is Temperance 14 which always counsels "between two extremes find the middle path". The block that crosses over is the 9 of Pentacles - the woman of independent means. Perhaps this card is telling me that what is blocking my path is independent means that would free me up from the work-a-day world. The mindset (card above) is the 8 of Wands - success and progress happening quite rapidly. Perhaps this indicates hopeful thinking. Beneath these cards the foundation is the Queen of Cups. I see my wife in this card and the support that she provides. The Soul energy is the Ace of Wands representing new passions, a new way of communicating spiritually and intuitively. The Environmental energy is the 4 of Cups- sitting under a tree choosing from the opportunities that are provided. Which cup do I choose for practical, emotional application? The Personality energy is the Fool indicating the potential I have available to me through my personality. I see this card as an affirming card that my personality is in tune with the Universe. It could also be suggesting that the personality associated with my soul being in this life is reasonably immature and needs to grow but the potential is there. The Outcome is the Knight of Pentacles - the act of doing something practical to make things happen. The card on the bottom of the deck for this reading was the Ace of Pentacles representing a new way of doing things and sensing the world. The Rune I chose was Hagalaz meaning change, freedom, invention, liberation and a need to break free from restriction, to stop identifying with material reality and instead experience "archetypal mind". Other keywords are "radical discontinuity". The Fairy card I drew was "Positive Expectation". This card said to go out and commune with nature at my earliest opportunity. Go out and tell nature what I was thinking and wanting. I immediately stopped what I was doing and walked out down to the creek. I need to do the follow up reading to see what is likely to happen if I act upon the Outcome card of the Knight of Pentacles. For me when I do Tarot readings I do not personally get the idea that I am overly psychic or clairvoyant etc. I do not receive visions, images or hear voices giving me messages. I acknowledge that everyone is psychic in some way. Ideas that jump into our heads may be intuitively derived without any awareness of the messages encoded into the process. Hopefully from my description of the readings that I have provided it gives you an insight into how my mind operates with the cards. For other people your interaction with the cards can be vastly different. There will always be a need for an interpretive process to determine clear meanings. Some people receive stronger clues than others. Tarot is a personal experience and each of us must develop our own relationship with the cards and the Universe.